You may know authors Rebecca Katz and Mat Edelson from The Cancer Fighting Cookbook. 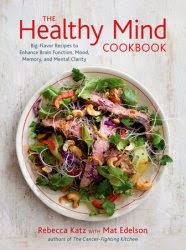 Well, they're back with another thoughtful and informative guide: The Healthy Mind Cookbook: Big-Flavor Recipes to Enhance Brain Function, Mood, Memory, and Mental Clarity. Check, check, check; I need help with all of those. Multi-tasking will wear you down and we all are doing more and more of it. With this in mind, it's no wonder that science has been taking a thoughtful look at the effect of the food you eat on brain function. Depression, ADHD, memory loss - is there a link? Using the latest research on the connections between the nutrition and mental efficiency, the authors have identified foods that can improve "the brain's ability to control cognition, emotion, and physical function -- all which dictate memory and mood." The recipes are easy to follow with beautiful, full color photography for each dish. It's a culinary pharmacy in your kitchen and it's delicious. Entrees, soups, tonics, elixirs - even sweets! If organics are important to you, they've got you covered, too. We tried the Double Red Pepper Hummus (p. 146) and I don't think I'll ever buy hummus again. Like a kid at Christmas, my family is targeting some of the recipes: Shrimp-Stuffed Avocados 2.0, Thai It Up Steak Salad, Ginger Scented Forbidden Rice, and Mexican Hot Chocolate are in my future. There's hope that the mental fog may lift in a yummy way. I'm watching Still Alice, which is about a very intelligent woman who has early-onset Alzheimer's. I empathize with Alice as she struggles to remember words. Perhaps I need A Healthy Mind. It drives me crazy when I can't think of the word I want. I've heard that is a great movie. I used to work with the elderly and I've seen that frustration. The saddest case was a lady (with a devoted husband who was there all the time) who developed Alzheimers in her mid-forties. Okay. I just wrote a comment in this box, and it disappeared after I clicked on Publish. I think I need to go to bed soon, and it's 5:40 p.m. I won't even attempt to re-create my response to your response. See? You can't blame me - no one is that quick! I just found out some of my mind problems, trouble with words, exhaustion and my lack of sleep, is from the fact when I sleep my brain is being starved of oxygen. I am 10 points below where I should be. Nice to know that maybe i can fix this and it is not Alzheimer. Yet ? Love the cookbook. I have two new healthy eating ones I hope to put into action. Love the "Thai It Up Steak Salad" name. Perfect. I'm the last person in the world to dish out nutrition advice, so I love that I can get a cookbook that has a clear focus, is an easy read, and contains recipes that I would make! One thing I love about Blogging for Books is the fact that I choose the book to review. This looked really interesting and it didn't disappoint. A cookbook review in which the word "WINE" never appears? Come again? Was that "wine" or "whine?" You could get this and then do a wine whine. Basically, I'm saying it could still serve your evil purposes... UnPish! UnPshaw! It was BOTH, because I always whine when there's no wine. Hey, I always use my whine for good and NEVER for evil. "UnPish!" and "UnPshaw!"? You mean they can be counteracted THAT easily? Sheesh! I had no idea. I guess I need to find more powerful "P-words". I have a microwave oven and I know how to use it. Otherwise, I would have been on a strictly liquid diet for the last couple decades. Hooray for Al Gore and his microwave oven invention! "UnPish!" and "UnPshaw!" is the best I can do. I've had a tough week, ha ha. Give me a few more days of sleep + vitamins and who knows what I might spew forth? As long as you're whining for wine for a good purpose, I will not interfere. I may need to see that plan in writing, however. (How did I get the DOC moniker? I've been meaning to ask...). It was you what provided me with the Medicated Milkshake what made me feel better when I was feelin' poorly. I have had many doctors with degrees who did much less for me... and charged much more. Of course, if you'd rather be "Nurse Cherdo"... but that doesn't have the right ring to it. I'll take it. LOL. It's the only doctorate I'll ever get. Fast food - check, deli food - check, ice cream - check, chocolate chip cookies - check. Time for a late night snack - check. What about chips? And back-up lard? Anything fried once could potentially be re-invented if you fry it again. Don't forget - beef for every meal. Sounds interesting, particularly since I'm a strong candidate for dementia for a variety of reason... I'll have to look it out. My grandmother slipped into dementia and I had an aunt who developed problems very young that seemed to be some sort of dementia. She lived with me for a while; it was a challenge. It sounds like a delicious approach to brain functioning. I'll start now and we'll know for sure in 25 years, EPT. NO THANKS! My mind is already perfectly healthy and I've got brain power coming out my ears. I owe it all to my strict diet plan - Pop Rocks and Jolt Cola for every meal. Well, okay, perhaps I was being a bit inflexible there. Maybe I should give some of these Healthy Mind recipes a try. I'm sure Mrs. Shady will be interested in trying them. She learned the art of cooking from her father, a restaurant owner in Baltimore, and she loves to experiment, improvise and try new recipes, especially ones that help improve brain function. As soon as I click on PUBLISH I will bring this book to her attention. Thank you very much, dear friend Cherdo, and enjoy the rest of your Thursday! When I read this book, my first thought was "Shadster just became a grandpa again. This book couldn't have arrived at a better time." I'd suggest you put Mrs. Shady on it immediately. Get a treadmill so you can have double portions of brain food and then walk it off. I can already see this is going to take up a lot of your time. Get an alarm clock - you'll have to wake up at an ungodly hour to get Shady Dell Knight's Music and Memories completed, but it is the price you must pay. Set it for 4 a.m. You'll need an extra breakfast and it will only benefit your brain in the end. Lastly, just in case this doesn't work as well as it claims, I saw a neat little head in a jar on Futurama. It would take the treadmill duties off your plate and there was an excellent view. I don't think I knew that Mrs. Shady is from Baltimore. Favorite Young Man went to Towson University and then lived in Baltimore for a while. He loved it there and still misses it. I could definitely try some of these recipes, but my hubby would probably protest. I'll pick it up and take a look. We all do need to eat better foods, for sure, but also need to stop all the multi-tasking. It's a woman's curse, don't you think. We need to improve our eating habits, too, Linda. Truthfully, there were plenty of recipes that we plan to try. My youngest was looking at the book, too! As far as multi-tasking, I've been telling myself for years that I need to slow down and push some things off my plate. It's hard to change but I'm working on it. If you figure out how to make un-multi-tasking STICK, let me know. This would require me having to cook. I am not a fan. I truly need to do something more healthier though for both the hubs and myself. Our waist lines have expanded a lot more than a wee bit. Fortunately, Holli, there were plenty of salads (a plus for me but then again, I have to go buy produce). Hubzam and I suffer from expanding geography, too. Not in a realtor way; more carbs and lipids staking a claim on our carcasses. Is there a "Dirty Minds Cookbook"? All there'd probably be in it are hot dog recipes. Oh, lordy, I snort-laughed coffee. It's your fault I have latte nostril. That's probably a good cookbook to have! Anything to push me in the right (nutritional) direction! I need to eat healthier foods! Although I'm more a fan of the Hungry Girl cookbooks, where she teaches you to make healthy foods taste more like the foods we love. That's the kind of magic I need. I'm a fan of those, too. They're great cookbooks! I'm glad you liked it, Linda! I'll have to post a picture of Dottie and the gang some time. I could definitely use more brain power. By the way, is the Bonehead Blog hop every month? I think I might do it every month...does the fifth still work for you? I've been really interested in maximising brain power lately. It's one reason I love learning new skills. This sounds like an excellent cookbook. I believe in this since I have hypoglycemia. Before being diagnosed, I slept 20 hrs a day, I slurred my words, I couldn't concentrate. I had a hard time thinking up the word I needed. Have I cheated-yup because I love chocolate but i try to be very, very good. We need to feed the brain nutrients and exercise as much as the rest of the body. Oh good grief, my body is saying..."what exercise?" Tuesday Newsday - Give It a Swat!